...is inspired by the namesake Hawaiian island. One summer, Anne traveled there on a whim and a dime. She never imagined that in this beautiful tropical land, ancient traditions would mingle with modern surf culture, creating a fun and sacred beachside atmosphere. 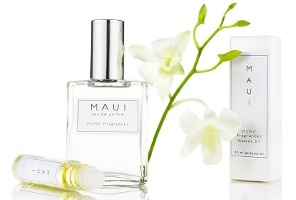 With top notes of young ginger and star anise, and a heart of frangipani, tuberose, and green bamboo, all wrapped in a light salty breeze, Maui is the essence of freedom with a laid-back vibe. Anne must have lived a sheltered life! Girl needs to check out the Nature Channel on cable! I could use a little freedom, myself. This sounds like it could be beautiful! This appeals to me too. There are a couple of salty fragrances I like – these notes sound so pretty. Just the mention of ginger had my ears perking up….however…I should not be looking at or perking up over ANYTHING! It all sounds great to me except the breeze…hope it is not ozonic. Been meaning to try this line for some time now and hearing about this fragrance pushed me over the proverbial edge. Ordered a bottle of the roll-on perfume oil and it’s lovely in a quiet and understated way. Mostly I get anise (this note lasts down to the base) , a smidge of tuberose, something vaguely crisp and green (perhaps that’s the bamboo note?) and an accord that smells like salty, beach air. Nothing too ozonic or marine-y – thank goodness for that! This will be a must-try for me. Just wish it had been inspired by my favorite, Kaua’i!